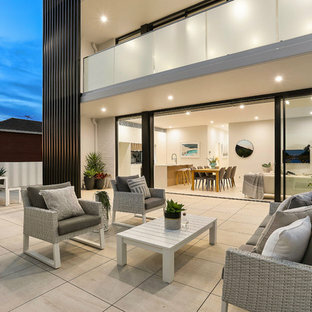 A patio is a paved outdoor area that adjoins a house, and is a popular addition to Australian and New Zealand homes. Not only is it yet another place to enjoy the great outdoors, but it can also save you time and money on landscaping. Often seen as an extension of the indoor living space, patios and courtyards can serve multiple functions. 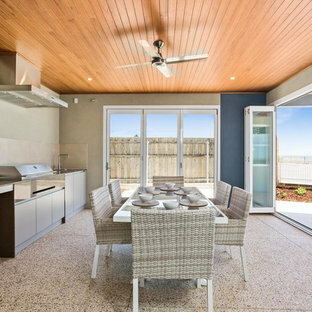 If you add outdoor furniture such as lounge chairs and a sofa, a barbecue or outdoor kitchen and a dining table and chairs, you can use them for entertaining, cooking, dining, and relaxing. 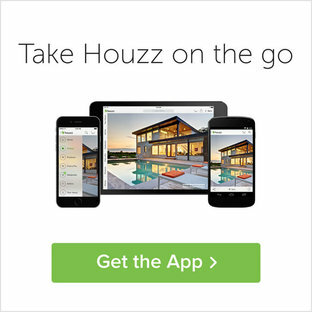 Browse the Photos on Houzz for courtyard and patio designs to see how you can best utilise your existing outdoor area. What materials should I use to construct my patio? Stone pavers and bricks are the most common surface materials used for patios, while concrete, tiles and gravel are also popular. Stone paving is usually at the top end of the price bracket, but is highly durable and the most natural-looking of the surface materials available. 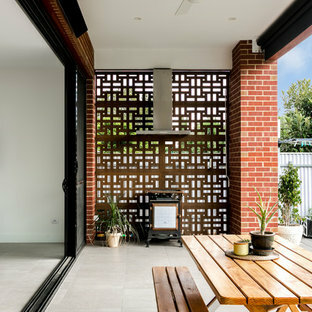 Brick patios, on the other hand, are relatively easy to lay, and provide a warm, rich colour that can complement traditional homes. Concrete patios are one of the least expensive to build and are also very durable, while gravel is quick and easy to install. You will also need to decide whether you want your patio covered or left uncovered. You can add roofing if you plan on using the space regularly, or opt for a pergola, trellis or umbrella for shade instead. 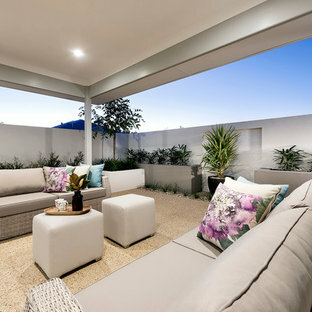 Patio enclosures, usually made from glass or mesh screens, can also transform your space into an outdoor room. A patio can be so much more than just a paved slab, if you add the right additions. 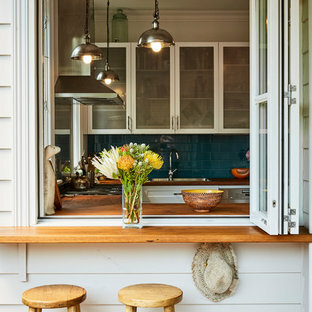 An outdoor kitchen and bar will help make the space the life of the party, while high-quality, low-slung chairs will make you want to stay outside for longer. If you have the budget, you may even consider adding a spa or pool. To make it the ideal al fresco area even when temperatures drop, a fire pit or fireplace will be able to keep you and your company toasty warm. To entice you and your guests into the space, make some room for greenery, even if you just a place a pot plant atop a table. It will help tie in the area to the surrounding garden. 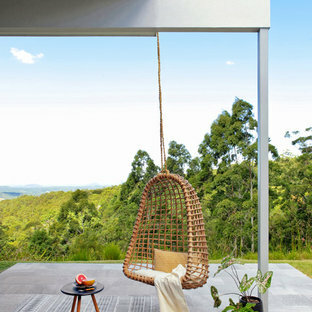 Fairy lights, garden torches and citronella candles will also help set the mood and keep the mozzies at bay, while soft furnishings such as waterproof rugs, pillows and chair cushions will add personality. 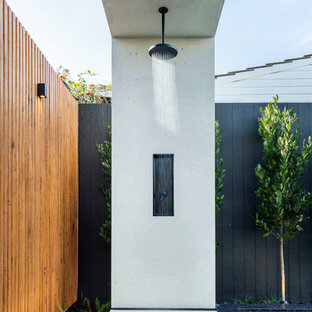 For something striking, consider adding a water feature or wall garden. If you're ready to hire a landscape professional to help you with the job, browse our directory here! 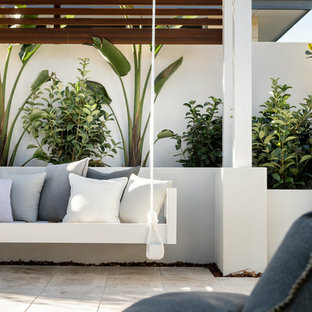 Swinging day bed make this spot in the garden a favourite to lay back and flick through your garden magazines.